The referee is the misunderstood man of football. He may love the game but will be accused of ruining it, and while the decisions he gets right are the least he can do, the ones he gets wrong are inexcusable. Abuse and scorn will rain upon him even when he has had a good day, but this is the price he must pay in order to serve the beautiful game. Pierluigi Collina no doubt knew as much as any man of the pressures and rancour a referee can experience. Yet the Italian referee became a widely admired, even loved, figure. Certainly fans of Football Italia will remember him fondly from Serie A Sunday afternoon kick-offs played in squinting sunshine. But for any football fan watching at the time of his service it would be hard to forget the emotive Collina. Tall and skinny, he seemed to glide across the pitch with powerful, spidery strides, his shoulders slightly hunched over. Alopecia took his hair at the age of 24 making him appear older than his years and giving him an air of wisdom. Without eyebrows, his eyes were highlighted: clear, round and penetrating. He looked upon players with such knowingness and conviction it seemed futile to feign innocence. 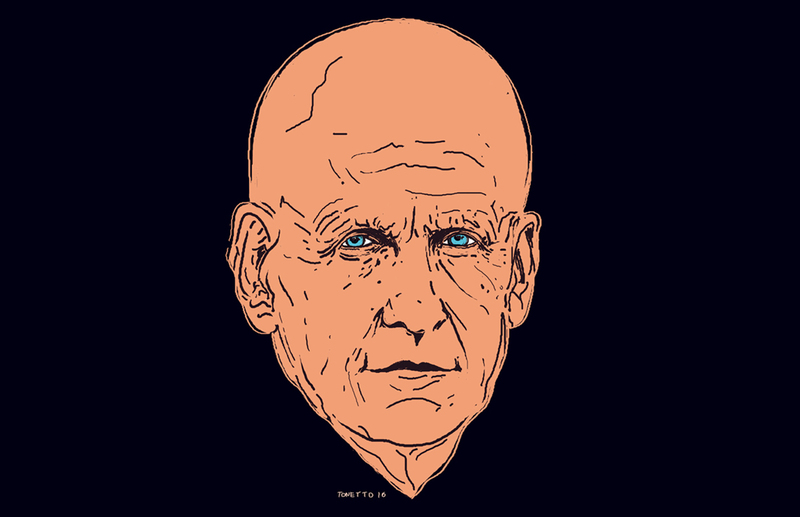 More than anything though, Collina came across as human – alive to moments of joy or anger. In a profession where the collective facial expression is one of blank seriousness and implacable gravity, he was individually emotional. With a quick word he could spark mirth in a player caught up in the fury of a game. As the England and Argentina players were returning to the pitch after the half-time break of their 2002 World Cup group match, Gabriel Batistuta remonstrated with Collina about a yellow card he had received in the opening stages of the game. The booking, Collina told him, had been called for by his assistant, “Of course you know the real reason why the assistant had you booked?” Collina asked. “He is Canadian, but he’s originally from Chile!” playing on the countries rivalry. “Ah, so that’s why!” Batistuta replied. At other times he could unfurl with furious anger. In a tense group match at Euro 2000 between the Netherlands and Czech Republic, the Czech defender Tomáš Řepka brought a surging Edgar Davids down roughly. Collina produced a yellow card as Řepka squared up to Davids menacingly. Collina tried to talk calmly to the defender, but Řepka would not listen and pushed forward towards Davids once more. Rage suddenly burst forth from Collina, his calm countenance replaced with intense fury as he moved toward Řepka, veins popping out of his neck, his head thrust forward and eyes glaring, yelling his ultimatum. He would later say this incident was a bad example for a referee to set, yet it had the desired effect as Řepka retreated instantly in a state of shock. Collina made quick progress however, and at the age of 31 he became the youngest referee in Serie A, one of only 35 referees to be assigned to the top flight out of a pool of 25,000 registered in the country. He went on to achieve all he could have hoped to in his career, refereeing the Olympic final in 1996, the dramatic Champions League final between Bayern Munich and Manchester United in 1999, and the 2002 World Cup final between Brazil and Germany. Receiving his medal following Brazil’s victory, a massive grin of pride crinkled his face. Whatever the level of the match though, intensive preparation was invested. Collina would spend hours watching recordings of the two opponents. When a match kicked off he would understand the tactical makeup of the teams and the technical ability of the players. A perfect example of this is the knowledge he took into that World Cup final in 2002. Recounting his observations, he wrote: “What had struck me the most about Brazil was the ease with which the Brazilian defenders and midfielders changed roles and the way they had no fixed positions in their attacking play. As for the Germans, I concentrated on Bernd Schneider’s role behind the forwards and the frequency with which Miroslav Klose headed down long balls from defenders playing them back to forward-running players.” Details such as these helped him read the game, so he knew where best to move on the pitch and where to focus his attention. Edgar Davids once asked Collina: “There’s something I don’t understand, when I go out onto the pitch, I go out to win, for me and for my team. But you? What do you go out there for?” It is a simple enough question, yet one that Davids did not know the answer to. It is also one that would rarely cross the mind of a football fan. Collina’s answer summed up his view of a referee’s role: “The referee is there to let the players best display their abilities as footballers.” He went out there to allow football to be played to its full potential. The motivation for this ethos comes from a simple love of the game. In The Rules of the Game, Collina expresses this love. He fondly recalls the “little pitch” a stone’s throw away from his house in Bologna where as a child he would play “never ending” games of football with friends. When winter came they moved inside to play a home-made version of Subbuteo with a tin-foil ball. He collected football stickers up until he went to university and watched Bologna play at the Stadio Renato Dall’Ara. ‘Knocked out’ of officiating at World Cup 1998 because Italy had progressed, Collina took in the festival of people and colour in Paris, and the emotion of the France-Italy quarter-final in the Stade de France. When you take into account the small proportion of referees that make it to the top level of their profession, it is safe to discount monetary gain as a motivating factor for referees. All that is left, then, is a will to serve a game they love. Yet no other referee has managed to convey this devotion in a way that Collina did. He joked with players and lived the experience with them. When games were disrupted he would become grave, even furious. It did not just simply annoy him that the spectacle should be spoiled but visibly angered him. He ensured the beautiful game lived up to its name and made it all the more human too.